As mentioned in an earlier post on this blog, I planted a fairly large plot of buckwheat adjacent to our vegetable garden this spring. 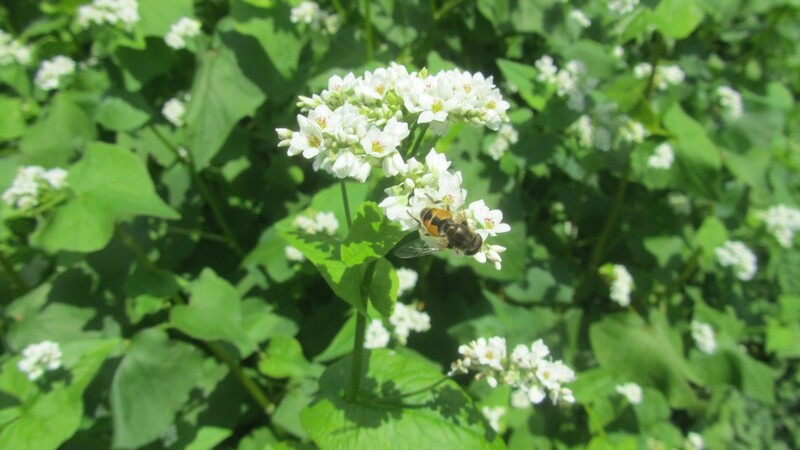 The main idea behind planting buckwheat was to provide forage primarily for honeybees and for any other pollinators that might be around to take advantage of it. As it turns out honeybees are in the minority. When surveying the buckwheat plot, I noticed for every one honeybee I saw there were ten or twenty other pollinators. They included butterflies, small wild bees, small wasps, many kinds of beetles, flies and hoverflies. Hoverflies are especially good to have in the garden. The adult hoverfly is a very agile flyer able to hover in one spot then zoom away, stop on a dime and hover in place again — they can even fly backwards. They don’t have teeth or mandibles so they can’t chew or tear into things. Their mouth parts are spongy and are designed to soak up nectar and other liquids as well as picking up small particles such as pollen. That is why they’re so attracted to the buckwheat flowers. Hoverflies have a superficial resemblance to bees. Hoverfly larvae on the other hand are insectivores that eat small soft-bodied insects. In the garden that means mostly aphids, thrips, leafhoppers and scale. All four of these common garden pests have a stage in their lifecycle when they are soft-bodied. After mating the adult female hoverfly buzzes around looking for a likely spot to lay her eggs, someplace where her young will have easy access to food. How does she know where the best spot is? Aphids and those other insects get all their nutrition from plant juices. They can only use part of the sugar in plant sap so they excrete the unneeded sugar as a syrupy liquid called “honeydew”. It’s the honeydew that attracts the female hoverfly: where there’s honeydew, there are insects for her young to feed on. During the larval stage, each individual hoverfly will eat up to 400 aphids and other insects giving it the needed protein to go on to further development. Since they are such good flyers, it’s very easy for female hoverflies to fly from the buckwheat to our vegetable garden and back again. The habitat that buckwheat provides enables the beneficial insect population to grow much larger than it would otherwise. That is a good lesson about the advantages of encouraging beneficial insects with plants instead of trying to maintain a garden in the middle of a sterile environment like a mowed lawn.